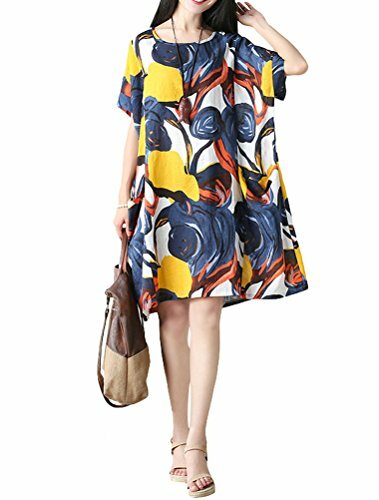 This printing dress is made of soft cotton linen, very breathable, drape good, comfortable to wear. CH04 fit US 2-14: Back Length:39.4",Bust:44.1",Shoulder:16.5",Cup sleeve:5.1,Cuff:16." CH05 fit US 2-14: Length:43.7", Bust:41.7", Shoulder:14.9", Sleeve:9.4", Cuff:12.9"
CH06 fit US 0-8: Length:41.3"-47.2",Bust:37.8",Shoulder:14.2",Sleeve:6.3",Cuff:12.6"
CH07 fit US 0-8: Length:52.4",Bust:37"
CH04: Dress weight is: 340g//0.75lbs, you can use a belt to make this dress to be different style. CH07 is made of soft cotton material, gradient braces dress, great for beach. Size information: PLS read the size details on Product Description, not the Amazon Size Chart beside the "size option"
If you have any questions about this product by Mordenmiss, contact us by completing and submitting the form below. If you are looking for a specif part number, please include it with your message.